The 2018 Florida State Fair was opened by Governor Rick Scott and Commissioner of Agriculture Adam Putnam on February 8, 2018. The state fair attracts nearly 500,000 people annually in the 12 days that it is open. Each year Florida residents create exhibits to display our states commodities and history. Starting in 1904, the first Florida State Fair was included a few agricultural exhibits that were showcased in a single building, now the fair is located on a 330-acre site and is home to a plethora of different exhibits from aquaculture production tanks to zoo animals. This year, the Salute to Agriculture Exhibit features a “Mooternity Ward,” where fair guests can watch a cow give birth to a calf, bottle feed a calf and interact with other farm animals. 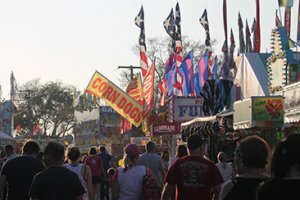 The Florida State Fair is open from Feb. 8-19 in Tampa. For more information, visit http://www.floridastatefair.com/.